Today, in the world as a whole, the most important single vegetable is doubtless the potato. The word is believed to be derived from the Spanish discoverers' understanding of the South American Indians' name for the plant, papa or patata. Over most of the United States, "potato" refers to Solanum tuberosum, the "white" or "Irish" potato, although in many parts of our South the term means "sweet potato". As to where our cultivated potato originated, no one can say more definitely than that it came from the Andean part of South America. The fragmentary and conflicting accounts of the old Conquistadores, traders, slavers, and plain pirates who made the early voyages to western South America are of little help. Unfortunately the white discoverers of Peru, Ecuador, and Chile were so bent on their quest for precious metals and stones that they gave no proper attention to the other riches of those lands. They or some of their close followers certainly discovered the potato, a find far more valuable to mankind than the loot they carried away; but none of them considered the potato important enough to record definite facts about it. Efforts to track down the origin of the cultivated potato, somewhat similar to those used in tracking down the origin of maize, have been less successful than with maize. Although the evidence is hazy, it suggests Chile as the country of origin. Many wild species of this plant grow in the cool parts of Peru, Bolivia, and Ecuador, but they seem generally more distantly related to our potato than do those now found along the coast and islands of mid-southern Chile. Some have believed that the Incas improved the wild, bitter potato of Peru to make it one of the mainstays of their life, along with maize. It is more probable, however, that the form of potato so important to the Incas was carried up into the Peru-Bolivia-Ecuador region from Chile in prehistoric times by tribes that preceded the Incas by many hundreds, perhaps thousands, of years. When first found by the white man, the Indians of the high country of Peru had the original method of dehydrating potatoes, a method they still use. They merely spread them in the brilliant sun and let them dry out. At high elevations in southern Peru, where the seasons are more marked than nearer the Equator, the potatoes are exposed to freezing, after which they dry more rapidly. The product obtained by these methods would hardly be acceptable on our markets, but it meets the needs of the Indians. After drying, the potatoes can be kept from one harvest to the next. They are pounded into flour or cooked whole. Remains of prehistoric stores of these dried potatoes have been found in old ruins. Indications are that the potato was unknown in Central or North America or the West Indies until Pizarro conquered Peru. The references to "batatas" in accounts of the voyages of Columbus and Magellan indicate sweet potatoes rather than white potatoes. Thus it seems possible that the white man first carried the potato out of its South American home to the other Americas as well as to Europe and elsewhere. One story holds that Sir John Hawkins introduced the potato into Ireland in 1565, and another says Sir Walter Raleigh first grew it there in 1585. In any case, it became of importance in Ireland before it did in other European countries or their American colonies. The stories about it being found in Virginia when first visited by the English are now believed to be due to confusion with another tuber-bearing plant. 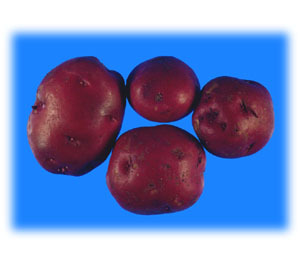 The plant became firmly identified with Ireland; hence the name "Irish potato," which persists in the United States today. During the 17th and 18th centuries the potato was gradually introduced into most other countries where it is now grown. It was brought to New England in 1719 from Ireland by immigrants who settled at Londonderry, New Hampshire. The kinds grown in those days were not nearly so productive or so good to eat as our modern varieties and were not very well liked. By the middle of the 19th century the potato was an important staple crop in northern Europe, the British Isles, North America, and to a less extent elsewhere. It formed such a large part of the food supply in Ireland that an epidemic of the late blight disease of potato in 1846-47 resulted in serious famine there. Oriental peoples have never cared much for potatoes and have not learned to grow and to adapt them to their conditions, as have the people of most other lands of temperate climate. Soon after World War II, in studying vegetables in Japan, I was amazed to find the potato in a state of culture far below that of most other food plants in that country, although it has been known there for perhaps 200 years.